The Nigeria media landscape has been awash in recent time with reports of clashes between cattle herders and farming communities, leading to destruction of lives and properties. The most recent of them is the reported attack on Fulani herders in Nasarawa State on April 30. Before that came the April 25, Ukpabi Nimbo community Enugu State attack where 20 people were reportedly killed by rampaging herdsmen. That of Benue State had assumed a perrennial status. The media especially social media, blogs and newspapers have been reporting these incidents with wrongly identified photos for illustration. The three most viral photographs used to depict killer herdsmen were indeed not taken anywhere in Nigeria, Daily Trust reports. Mainstream newspapers including the Punch, Vanguard, Thisday, Guardian etc have each repeatedly used the misleading photographs. Even Daily Trust failed in the past in this litmus test. The social media and online newspapers and blogs are the biggest culprits, Daily Trust checks show. Blogs such as Naij.com, Venturesafrica.com, Nigerianeye.com, Bellanaija.com and dailypost.ng. com among many others have made these photos as their postal stamp in herders attack reports. Each of these reports on herdsmen attack, you see accompanying photos of a herder brandishing an AK 47 rifle. One of these photos (see below) is the one having a bare-chested man with a rifle strapped to his neck. At the background is a herd of cows. Daily Trust’s checks showed that this photo has no origin in Nigeria. The photo credit belongs to Reuters/Goran Tomasevic and it was first published online on December 14, 2013. It is a photo of a man from Dinka tribe holding his AK 47 rifle in front of cows in a Dinka cattle herders’ camp near Rumbek, capital of the Lakes State in central South Sudan. Another photo which has gone so viral that one finds it difficult to locate the very origin is the one with a young man herding cows with a rifle hanging on his shoulders with both hands holding it from the two ends. The earliest active use of the photo was on January 27, 2015 in the Standard Newspaper of Kenya before Nigerian newspapers cashed in. 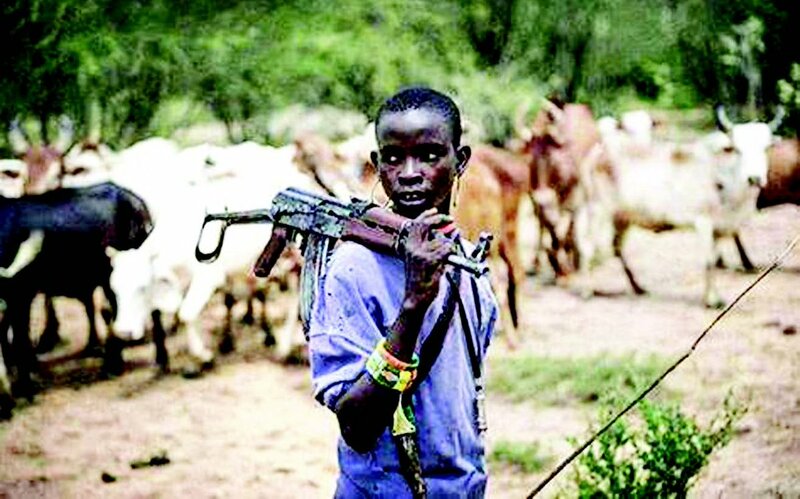 Yet another photo that has found massive patronage by the Nigeria press shows a young Pokot warrior by the name Korinamba Ruto, herding his cattle with an AKS 47 gun on his shoulder which the caption says he carries for protection against attacks from cattle rustlers from the neighbouring Turkana community, Kenya. The photo date is June 19, 2012 and the credit and copy right is owned by Sven Torfinn/Panos Pictures /Felix Features. A simple search using the Google reverse image search or Tineye reverse search will help to resolve the question of where the photo is coming from. Cattle rusting has been rife in Kenya as some of the ethnic groups there have cattle herding as a main occupation. He blamed the practice on some journalists not being “ethically” informed. Journalists should particularly watch their language, he says.